Business has its own language that can sometimes be confusing. For example, many people interchange marketing and advertising, when in fact, they’re not the same thing. The financial paperwork around running a home business can be confusing too, but it’s important to sort it out, so that you’re sure to keep accurate records, and can easily understand your business’ financial situation. Two very important bits of paperwork are invoices and receipts. An invoice is given to a customer or client before they pay. It itemizes and calculates what they owe you for time, work, and/or materials. For example, if you’re a graphic designer and created a graphic for a client, you’d invoice them for the time it took you to create the graphic. If you had to buy a photo or clipart, you’d bill for that too. In a home business, you might receive an invoice, as well. 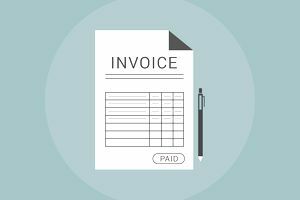 If you have a virtual assistant or hire someone to help you in some aspect of your business, they might send you an invoice. What Goes on an Invoice? Your company name and client’s name, along with addresses. The date the invoice was created. This is crucial for a timely payment. Date(s) and description of the products or service provided, including price of each, and total quantity ordered. If there was a deposit or other fee paid up front, you want to acknowledge it was paid. If you offered a special rate or added bonuses, include those. Sales tax if a tangible item and your state or the state the customer lives in collects sales tax. If you’re sending a second invoice because the first wasn’t paid, and you add on penalties for late payment, you’ll need to include that as well. Terms of payment. This can include how the client can pay, such as “Make Checks to…” or “Send money through PayPal to…” It also needs to include the date by which the invoice should be paid. For example, “Net 30 Days,” which means it should be paid within 30 days. Invoices can be delivered in person, by mail, or through email. You may use email as a default, but then decide to send one by mail to a client or customer that is late in paying. Any invoice you receive, you should pay immediately. It’s bad business not to honor the contracts you made with others. If you’ve invoiced a client or customer who hasn’t paid, you have several options. Send a second invoice with a “Due Now” notice. It happens that invoices get lost. Sending a reminder may be all that is needed. Make sure that all your invoices are clear about when payment is due. Take the client or customer to small claims court. This would only be advisable if the amount owed is large because of the expense of going to court. Send the debt to a collection agency. If you’re willing to give up some of the money from the invoice, you can involve a debt collection agency that will work to collect the money in exchange for a percent of the payment. Write-off the non-payment as a loss on your taxes. For small bills, writing it off will be the easiest, but if you have a large bill, court or a collection agency can help. It goes without saying that you shouldn’t continue to work with a client that doesn’t pay. Receipts are given once your client or customer has paid their invoice. It’s essentially proof of purchase. Along with providing receipts to your clients and customers, you should save any that you receive in relation to your business. Your receipts make it easy to calculate your business expenses deductions at tax time, and show proof if the IRS ever questions your taxes. What Goes on a Receipt? While invoices require specific information by law, there is no standard for what goes on a receipt. What appears on a receipt can vary from business to business. Ideally, it should have information about what was paid for, the date it was paid, and how it was paid (although it shouldn’t have specific payment data such as credit card numbers). Some businesses just re-create the invoice and put PAID on it. Similar to invoices, there are a variety of ways to create a receipt. If you’re using a bookkeeping program, it can generate a receipt when you log in payment of the invoice. If you’re using a template or handwriting in a receipt book, you can create the receipt when you receive payment. Ideally, receipts should be given immediately upon payment. If one isn’t automatically created and delivered, you want to create it and send it as quickly as possible. Like invoices, they can be given in person, emailed, or mailed. When you deliver a receipt, make sure you mark the payment in whatever accounting system you use. If you’ve received a receipt for payment on products or services related to your business, file the receipt and mark it in your accounting system. This information is important to staying up-to-date on your business’ financial situation, as well as taking tax deductions at tax time. Essentially, when you provide a service or product, you send an invoice. Once your client or customer has paid, you send a receipt. As a business owner, you may receive an invoice for work done on your behalf or a product purchases, and once you pay, you’ll receive a receipt.